Trainer Danny O'Brien's New Zealand staying prospect Bajour could not have been more impressive on his Australian debut with an excellent win at Geelong on Wednesday. The win in the 1400m BM64 event was even more meritorious given champion jockey Damien Oliver was caught wide the entire trip on the gelding. "He has only had one trial at home and we were using today as another trial to get him fit and build him towards his preferred distance range, so his performance was very, very impressive - especially given the fact he was carrying 61kgs too," O'Brien said. "His two wins in NZ have been over 1800m and 2100m, so we expect him to have a great amount of upside moving forward." O'Brien said he planned to run the lightly raced five-year-old through his classes over the summer similar De Little Engine last season. 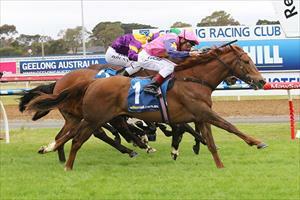 Bajour's win today was his third from 18 starts and took his prizemoney to $44,000.